I wasn't originally going to share these photos as overall, I'm really disappointed in them, the colours are dull and most of the results are a little blurry (wrong camera and film choice I think. Bother). However I mentioned before about 'keeping it real' and sometimes I think that the process of working towards a great photo is just as important as getting that great photo and these photos are definitely part of the process. I took all these photos in an attempt to populate my photos, to document the people around me as well as the landscape. This is a challenge for me and something I struggle with when I go somewhere new. I studied Interior Design at university so I am automatically drawn to architecture and perspective photos, so training myself to look for interesting human moments is really quite difficult when I'm constantly distracted by interesting designs, shapes and lines. I think its so easy to fall into habits with your chosen hobby, to know what you're good at and just stick with it but film (and toy camera) photography to me has always been about the challenge, and I'm hoping that when I look back at these in the future, I'll see these photos as the beginning of a new, tougher challenge and hopefully I'll be able to see some progression too (fingers crossed). I'd love to hear about how you push yourself in the comments - either with photography or elsewhere, sometimes even a small push is all we need to improve, so lets encourage each other! 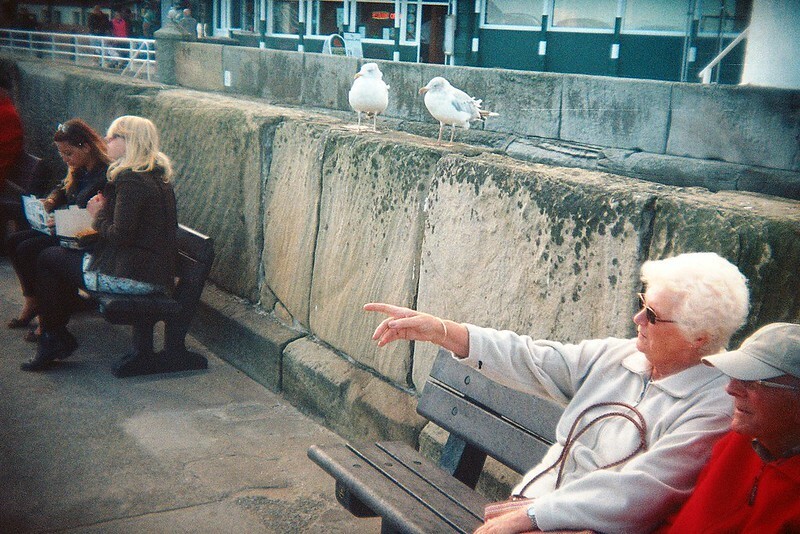 Camera: Holga 135bc Film: Lomography ISO 400 (usually a winning combo but not this time) Location: Whitby, England. p.s. if anyone tells me how great these photos are, I won't believe you lol, I'm just saying!